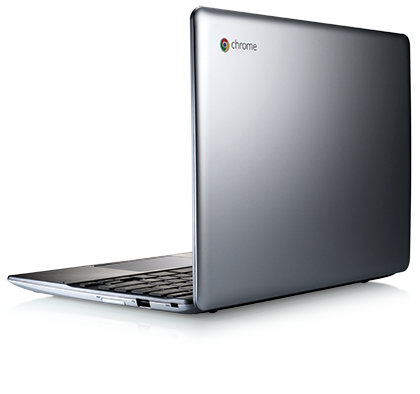 Chromebooks are powered by the Google Chrome operating system, an enhanced version of the largely popular web browser. With a Chromebook, all of your programs are accessed through the internet (or downloaded for use in offline mode) and all of your data is saved to the cloud, so there is no need for large amounts of hard drive space or RAM. Chromebooks are transforming information technology in schools throughout the World. Alongside the significant savings and performance enhancements, an upgrade to Chrome offers you the opportunity to revolutionise your learning environment through many dedicated applications designed specifically for the classroom. Please click here to find out more about the benefits of Chromebooks, or take a look at our Solutions Guide. Don't just take our word for it — experience the innovation first-hand with a pilot programme for one of your class sets: Free Chromebook Trial for your School. Chrombooks boot-up in seconds and resume instantly. Chromebooks download and install security and software updates automatically so you don't have to. Built-in security means you're safe from viruses and malware. You don't need to install security software on any Chromebook.